So you’ve spent the day lounging in the sunshine, splashing in the surf, exploring the Halifax Historical Museum or paddleboarding along Ponce Inlet — now what? 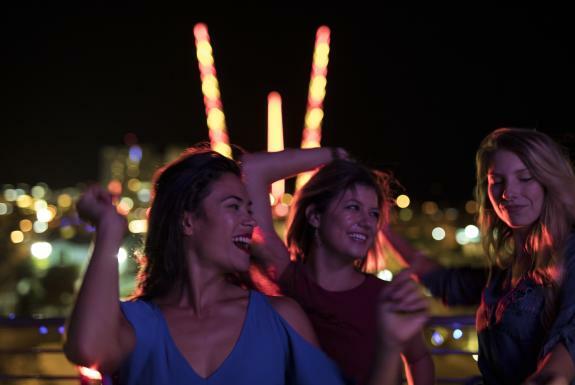 When it comes to evening entertainment, your options are unlimited in Daytona Beach.From sophisticated arts soirees to casual cocktails at a local beach bar, Daytona Beach has a vibrant nightlife that spans the spectrum. Here are a few ideas on how to create a night that’s the cherry on top of a perfect beach day. Sip and savor new experiences. Seeking a spot where you can unwind and savor the sweet taste of relaxation? Wine-Me serves as the ideal place to enjoy good food, delicious wines and great conversation. But the options don’t end there — Wine-Me is a combination of a craft beer bar, fine wine shop and café. Savor perfect food pairings with your beverage with offerings such as artisan cheese plates, flatbreads, panini sandwiches, specialty salads and more. And, you can enjoy this hot spot no matter what end of the beach you stay on. There are two locations — one on historic Beach Street in Daytona Beach and one on West Granada Boulevard in Ormond Beach. And the Beach Street location is open until midnight on Friday and Saturday nights! Have a two-steppin’ good time. If you’re looking for a lively place to get down country-style, pop on your cowboy boots and head to the Rockin’ Ranch in Ormond Beach. Each Monday, Wednesday, Friday and Saturday night at this joint sees a crowd of country music-loving people having a good time on the dance floor. No special skills or experience are required to get grooving on the dance floor — just let the music move you and have fun! Enjoy drink specials as you rock out to a variety of Southern rock, country, classic rock and blues music. Sit back and enjoy a show. If live entertainment and cultural spectacles are how you’re looking to spend your evening, check for performances at Peabody Auditorium and the Ormond Beach Performing Arts Center. These venues have attracted a range of world-class talents over the years, including Jerry Seinfeld, Liza Minnelli, Elvis Presley, James Taylor and so many more. From world-renowned symphony concerts and Broadway touring shows to Daytona Beach-area performing artists, there’s always some way to soak up some culture while you’re in town. Sip sangria at an oceanfront bar.